After an initial surge in traffic when it launched last year, Econet’s classifieds property, Ownai, might be experiencing a sharp downturn in visits to the site. A look at the site’s estimate traffic using the SimilarWeb analytics tool shows the site has dropped about 67% in visits since December 2015. To be clear, I should reiterate that this is estimate traffic and we’re only discussing the numbers here to show trends more than focus on the exact traffic figures. You can read this to understand why exact traffic figures can’t be the focus. Econet is in a closed period pending the release of its annual results and therefore is unable to comment on material developments within the group. Also please note some of the information required is competitive. We can however confirm that the trend you have mentioned does not reflect the actual performance. The sharp rise of Ownai traffic in November actually makes sense because the site was launched at the end of November 2015. That and a generous helping of an SMS campaign soon after launch. However, if the Ownai SMSs in my phone are a reflection of what they sent to everyone on the network, there was only one SMS sent in January and another February. None has been sent yet in March. This might explain the drop in traffic. But a traffic drop also means that there aren’t that many return visitors – a typical visitor would come to check the new marketplace out, maybe post an ad, close and never come back. Another event likely related to the drop in traffic is the departure of Ownai’s Head of eCommerce last month. We, of course, have no idea why he left, and Econet wouldn’t say why only confirming the departure and promising an announcement would be made of his replacement. Thing is, a leader leaving just 3 months after the launch of their project is usually a sign that all is not well. 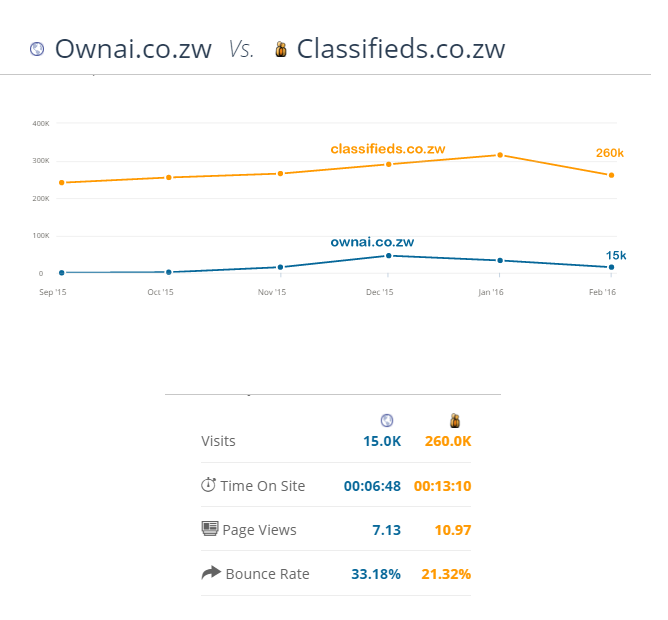 To see the relative audience sizes, we ran compared the Ownai traffic trends to those of Webdev’s classifieds.co.zw, which has been the dominant marketplace platform in Zimbabwe for years now. The interesting thing we observe is that while traffic seems to have grown in January, their traffic also dropped in February, falling about 19% in total monthly visits. Again, in a relative sense of the figures instead of the absolute, Ownai is clearly a long way in catching up to Classifieds. The methods Econet employed to increase visitors to the site (Zero rating it for Econet subscribers + an SMS campaign) may not have yielded the significant difference we all expected them to. Might seem strange since zero rating seems to be working exceptionally well for another app on the same network, until you consider the differences in the apps. Ownai’s value is in it having an adequate number of sellers and buyers (organic ones and not the ones mechanically seeded by the marketplace). Whereas biNu, for whom zero rating has worked, just aggregates content on the web and provides it to Econet subscribers who don’t have any data at zero cost. It might be the case that zero rating makes little difference if the basic chicken and egg issue of marketplace liquidity has not been overcome. Or, put simply, free does not equal value. Organic value will likely take longer to develop with other value-adding differentiators being needed – like solving the delivery problem which existing marketplaces seem not keen to touch. Econet seem to launch a new service every few months but how many are still successful the following year (Connected car? Ecohealth? Ecofarmer?). Surely it would make more sense for them to target fewer opportunities and properly invest in those with big $$ marketing campaigns (like they did when Ecocash first launched). Right now they seem to venture into practically everything and anything just because it might just work but spread themselves too thinly to ensure longterm success. They might have a nice freee site but it won’t last if they can’t convince the mass market to use it. no money to buy stuff + no stuff to sell = hard times for all local business (whether on or off-line). guess a similar situation can be seen in local markets. loosing hope in our economy! share price down 50%, suppliers not being paid, budgets cut, most expat staff jumping ship. Things domt look great for econet. this economy creating a storm for telecoms industry. So Hammer & Tongues reportedly invested $200k marketing their e-commerce platform (according to techzim?) In comparison, econet have barely invested anything to promote ownai. While zero rating and sms are useful, they are practically free for mobile operators (right?). Unless econet invests more to promote ownai, this service will struggle. They might have taken a big hit in this economy but Econet cannot expect future success without continujng to invest once a product has been laucnhed. If econet is going to succeed with e-commerce i think they need to replicate what they do with the traditional side of their business and commit to going big on marketing. How can econet “go big” on marketing when their revenues are continuing to fall? Or maybe they have a secret money tree in over at Masasa. You make some sounds points but don’t 4 in every 5 startups end up failing? If that’s true then it might be worth spreading it’s bets on a number of different ventures with the hope that a couple will take off. I admit that’s easier said than done with limited resources but makes sense in theory at least. I met the former ownai head guy at their launch. He explained that for ecommerce to take off it would need extensive awareness campaigns to educate and demonstrate the benefits to local businesses and build up long term relationships with business owners. From what I’ve seen, econet instead decided to send some sms and make the website free for users. Surely they should have listened to what their own head of ecommerce advised. Why cant econet host ecommerce training and awareness events and put out more information on what sites like ownai can do to help the average guy on the street. Most people I know have a pretty limited knowledge about what are services available and how they work. Unless they invest into doing that sort of thing I cant see how people are going to start using these online services they keep launching. The end point is can ownai help me sell classifieds managed to sell for many people. Pks it didnt jelp that when i wanted to post an as they said no pics no post. Its not about qualuty bt ability to sell. Ive been satisfied with my experience so far. Listed vehicle for sale back in february and have had over 10 enquiries so far. A few serious offers but haven’t sold yet as both were still below asking price. So long as it remains free to.list ill continue using it. I have owned several businesses in the past 16 years and i think Econet is going down. Most of their ventures are going bust.I read a story about Seldon water recently then share price falling now solar clearance sale. Instead of starting ownai they should have partnered classifieds. Instead of this connected home partnering safeguard os good idea. They should learn to partner local businesses not trying to be big boss of everything. Seems to me they trying to use a very heavy corporate-type staff and culture and put it into entrepreneurial ventures. Trying to get employees to be hustlers. That’s why all their ventures seem to flop. Partnering is definitely the way forward – coz then you still keep that entrepreneurial spirit from the founders. The founders of startups have that entrepreneurial spirit that long time econet employees may not necessarily have because they have been stuck in organisational culture for so long. But to launch these new things, you need the entrepreneurs’s mind. Corporates will always find it hard to replicate the startup model. The nature of a corporate means that every moves at a slow pace. You need to get the buy in of so many people in order to get anything done. Even if you hire good teams the organisation itself will stand in their way. Partnering is probably the better answer. You won’t have full ownership but you can save a lot of costs and experiment without too much risk. Doing everything yourself will eventually bankrupt the business. Econet would seem not to have learnt that lesson even after so many attempts. Google has a way around this their 70 30 model. Employees are given time to work on their own projects: the results Google News, Gmail etc. The other method is to acquire start ups for example YouTube. Econet is doing a Yahoo! agree with yours and other points here that evidence mostly shows launching something new from inside is super difficult. They pulled it off though with EcoCash and credit has to be given where its due. In fact in my time reporting on local tech, I’ve never seen a team work as hard as the EcoCash team did. They “moved fast and broke things” and it worked. Of course it’s easy to say, ah but they copied MPESA, until you realise that in many countries a lot of MNOs tried to copy MPESA and failed. btw, Yahoo has gone acquisition model over building from inside. See https://en.wikipedia.org/wiki/List_of_mergers_and_acquisitions_by_Yahoo! seems to have stopped in 2014 though. Yahoo paid $1 billion for a 40 percent stake in Alibaba in 2005 and is now reaping a huge return. Alibaba is paying $7.1 billion in cash and stock to buy back half of Yahoo’s holdings. Another $550 million is being paid to Yahoo under a revised technology and patent licensing agreement with Alibaba. Yahoo is failing because because the main business is failing, they low on cash so recently they were buying junk startups. facebook owner is now the sixth richest because he bought into Instagram and whatsapp .Google bought into Youtube. Ecocash is not a startup but an Econet product. I dont even know why they try to seperate the two.Most telecom companies have that mobile money product, its only successfull because Econet is also successful. They seem to have launched a useful service and I like their site, but a classifieds service will only be successful if they manage to attract visitors – why would I list something to sell if there aren’t many buyers to see it? This reminds me of previous econet launches – they develop a new product, launch, and then expect customers to automatically sign up just because its an econet service. Ecocash took off because econet supported the launch with a huge nationwide awareness campaign. By doing so they managed to educate the market and secure their position as the go to mobile money service. If ownai traffic isn’t growing at is stage, it’s because econet is not promoting it heavily enough. How can they expect to increase the number of visitors if people don’t know about the service and how to use it. Econet might be seriously struggling in this economy but they need to commit a lot more marketing spend if they want this product to succeed. true but they copied with the righ market conditions its sort of sad that the brains behind mpesa didnt choose to patent their develppment but good for the rest of the world. I don’t know if its me only. But I use an Android device and mostly i like using opera mini. Every time I try using Opera mini to view the site it does not load. Its always a blank page. I tried using other browsers and it works but for me opera mini is the best so i don’t visit their site anymore. Opera mini has many limitations. Its lightweight and good on data savings but many sites do not display properly on this browser. Its an economy browser when you low on cash but if you want quality go for explorer or chrome.Econet made opera popular in Zim . Well just goes to show you cant Zero rate your way to success. I wonder if Econet ever considered just Zero rating classifieds.co.zw and including them in their billboard campaigns in exchange for equity. It would have been a very cheap investment. I think they have a problem in their business development department where they are spending a lot of time creating new brands instead of investing in startups who already have a proven track record in that area. Econet are very hostile to partnerships. They have a mentality of full ownership or nothing. That might work ok when you have a massive war chest like google or Apple. Econet don’t have even a small war chest to support all these new startups they’re launching. They can’t even pay their staff properly let alone finance new businesses.